SIGN UP TO RESERVE YOUR INITIAL SPOT to confirm class availability (no payment is required). For further information including pricing visit our FAQ page. TAPfit BLACKBURN STH Fridays 2.00pm Child minding facilities available at this venue! This class is organised in partnership with The Avenue Neighbourhood House at Eley, casual attendance is not permitted at this venue. To enrol for the term, please visit The Avenue or call Robyn on 9808 2000. Book your TAPfit Spotswood session with Jade from BeDancefit here. Remember to tell Jade that Lisa from TAPfit Melbourne sent you 😉! TAPfit classes follow the Victorian school term calendar. However do also run special holiday sessions. Classes do not run on public holidays. To honour our duty of care to you our clients TAPfit sessions will be cancelled if the temperature reaches 40 degrees and above to ensure your safety. This will be determined by the Bureau of Meteorology and clients will be advised my text of any cancellations. Purchase a 6 class pass for $100. Prices include the use of TAP attachments, that slip over your training shoes and all equipment required during the workout. RESERVE YOUR SPOT NOW FOR a TAPfit Melbourne Workout! We do not hold stock, tops are made and customised to your order. Please make sure you order your size as per the size charts as WE DO NOT OFFER EXCHANGE. Once we receive your order we will issue you with a PayPal invoice for prompt payment. 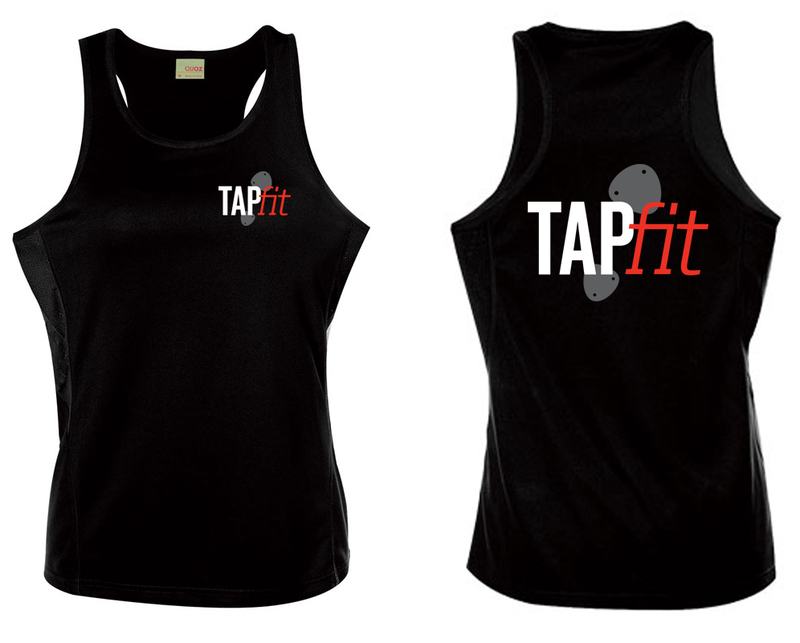 Tops will be available from Melbourne TAPfit session locations once we have received back from our amazing supplier. You will rediscover your love of tap dancing with TAPfit Melbourne Instructor Lisa Koba, or if you have never tap danced before you will have an absolute ball learning! Lisa's love of dance started at the tender age of 4 in her native state of South Australia under the close guidance of Glenda Furnell. Lisa has such wonderful memories of the many hours spent in the dance studio. After completing secondary school Lisa set off to Melbourne to follow her dancing dreams. She was fortunate enough to study under the under the leadership of Jillian Fitzgerald, Anne Marie Brazier, Janet Liddell and Greg Mills. Lisa taught at dance schools around Melbourne and worked as a freelance performer in Theatre Restaurants, on television, and at charity and corporate events. Early in 2016 Lisa wanted to fuse her love of dance together with a general fitness regime so she completed her Certificate III in Personal Training at the Australian Fitness Academy. Lisa is now excited to be bringing TAPfit to Melbourne. Come and join Lisa at one of her classes and let's get TAPfit together! Jayne has over 30 years dance experience and is trained in Jazz, Tap and Ballet. She has choreographed musicals throughout Melbourne and was awarded the Victorian Music Theatre Guild award for Best Choreographer for her work on ‘Song and Dance.’ She has choreographed numerous school Rock Eisteddfod’s and has been a specialist Tap teacher at various dance schools throughout Melbourne. Amanda has had 20 years of dance teaching experience and is a qualified dance and primary school teacher. She has also completed a Certificate III in Dance Performance at The Edge Performers School, where she studied Tap under the tutelage of Paul Davis, one of the original 'Tap Dogs'. Amanda has worked in the dance/performance industry as a dancer, model and choreographer. Her professional work includes performances at The Crown Casino, The Royal Melbourne Show, corporate events, fashion parades and cabaret restaurants.